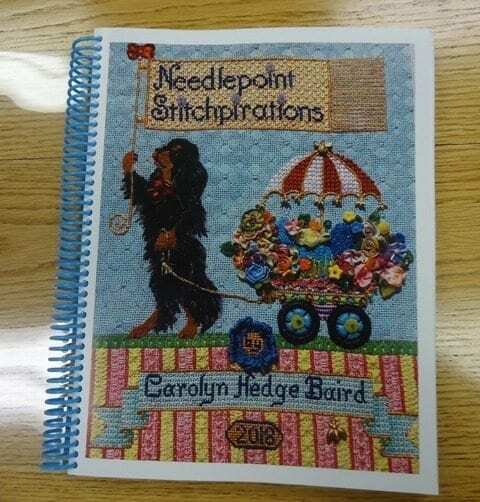 After months of waiting, I can finally tell you that Carolyn Hedge Baird’s NEW book Needlepoint Stitchpirations is here. 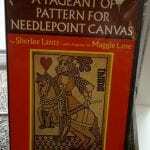 The cover is just beautiful (as seen above), this canvas was designed especially for Carolyn by Brenda Stofft. That’s Carolyn darling little dog pulling a cart of flowers with lots of great techniques on both items. 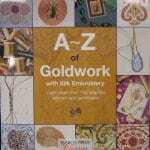 But more about the book! 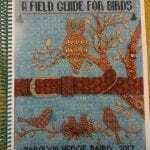 and LOTS of indexes so you can find stitches with beads/sequins, using 3, 4 or 5 kinds of threads. HANDY! 328 pages, wire-bound, 8-1/2 x 11″ format and tons of graphs throughout, this 2 lb. book is impressive, inspirational AND I’m even in it! 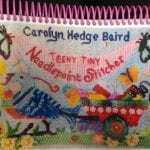 Carolyn was kind enough to ask me to comment on what inspires me to needlepoint and what needlepoint inspires in me. I’m thrilled to be in her latest book. NOTE: I can ship this via Media Mail (book rate) if you are only buying books. Otherwise, please choose a different shipping method.